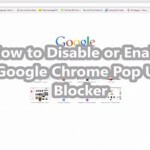 This video will show you how to turn off pop ups in Google Chrome by going into the settings menu and either turning on or off Google Chrome pop up blocker. There is also an option to manage exceptions in case you want to leave pop up blocker on and only allow pop ups on certain sites or domains. This is great if you are working or visit a site frequently that pops up new windows that you need to fill information out in. First you will navigate to the top left of Google Chrome and locate the 3 bars going across in a square. Click on this and navigate to settings. From settings you will want to go to Advanced Settings. Once you are in the Advanced settings you are looking for the Privacy options and you will need to go into those to edit them. Once you are in the privacy settings about 5 or 6 items down you will locate the pop up blocker information. If you have any questions please leave a comment below and I will assist you.